Click to get the report. Recognizing the prevalence (1 in 7 women will suffer) and serious implications of untreated maternal mental health disorders for mothers, children, families, and society more generally, the California Legislative Women’s Caucus put forth Assembly Concurrent Resolution (ACR) 148 which was passed in 2014. 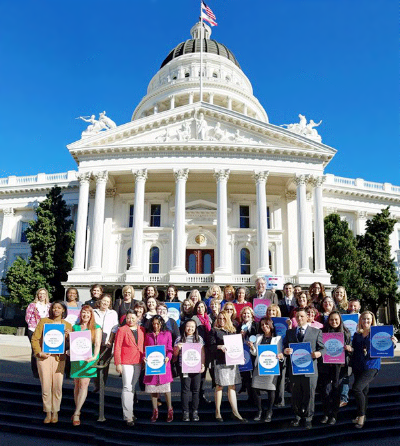 ACR 148 requested that the California Maternal Mental Health Collaborative (now known as 2020 Mom), a nonprofit organization, establish a task force on the status of maternal mental health care. The California Endowment provided financial support for a research team at California State University - Fresno and 2020 Mom Executive Director, Joy Burkhard, to convene the task force. 2020 Mom was formed at the urging of the legislature in 2011 and receives its funding from private donations. 2020 Mom has been convening researchers and public and private change agents in California to “get to the bottom of why” women aren’t been screened and treated and setting forth a new path for hospitals, health insurers, and doctors. 2020 Mom also addresses maternal mental health on the state and national level through convening the National Coalition for Maternal Mental Health. The Central Valley Health Policy Institute (CVHPI) was the research and program management body behind the Task Force, coordinating statewide surveys, in-depth interviews, and quantitative analysis to explore the current maternal mental health context in California. The Task Force was funded by private sources. The California Endowment provided $100,000 to cover the fees of the research institution, the Central Valley Health Policy Institute, which provided project management and research expertise. The California Health Care Foundation provided $80,000 to cover the facilitation fees of Bruce Spurlock, MD, President and CEO of Cynosure Health Solutions, and wide-spread communication of the Task Force recommendations. 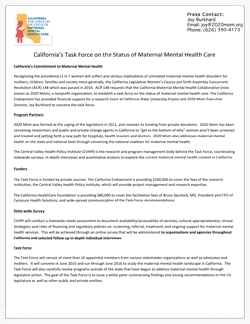 From June 2015 - June 2016, the Task Force, consisting of more than 20 appointed members from various stakeholder organizations as well as advocates and mothers, convened to study the maternal mental health landscape in California. It also carefully reviewed programs outside of the state that have begun to address maternal mental health through legislative action. The goal of the Task Force was to issue a white paper summarizing findings and issuing recommendations to the CA legislature as well as other public and private entities.